What is the name of the grape that originated in southern France and goes by “cot” in that region? It is a very dark, almost black grape. Thanks Wine Ladies. What you need to know about red wine. My husband says red wine should always be stored at room temperature whether it is open or not. I heard that once red wine is opened it should be kept in the fridge, then brought to room temperature just before serving, who is correct? https://www.thewineladies.com/wp-content/uploads/2017/08/WineLadiesLogoTransparent.png 0 0 Susanne Seelig-Mense https://www.thewineladies.com/wp-content/uploads/2017/08/WineLadiesLogoTransparent.png Susanne Seelig-Mense2008-11-29 12:00:012008-11-29 12:00:01What you need to know about red wine. Two icons came together at a press conference on Monday, November 17th announcing their affiliation between our Canadian PGA TOUR, Masters Champion, Mike Weir and the Bosc’s family Chateau des Charmes, a pioneer in our world of Ontario wine. The anticipation and energy in the room could have lit up half of Niagara, as cameras set up and various media including sports broadcasters and journalists as well as wine writers and radio personalities dodged for positioning. What is the future for Mike Weir Wine, one of the best selling and fastest growing Canadian wines in the market today? All Mike Weir Wines will now be made in conjunction with Chateau des Charmes of Niagara-on-the-Lake, a pioneering winery that planted Niagara’s first commercial vinifera vineyard 30 years ago. And the roots of the Bosc family are deeply planted, with six generations of wine background. Paul Bosc Senior, the founder of Chateau des Charmes sits proudly as his son Paul Bosc Junior takes the stage with a lively, engaging and sometimes very funny speech. What a sandbagger that Paul Bosc junior is! as when he approached the mic began by stating he could never match the eloquence of the speeches of Barry Katzman President Mike Weir Wine Ltd and of Mike Weir’s of course. Paul, you get a gold star, particularly when you talked about your father receiving the Order of Canada and encouraged Mike Weir, soon to be a recipient (Congratulations Mike) not to listen and bring along as many family members to the ceremony as you wish. Mike Weir tells us that his goal is to continually build on the quality of the wine, grow the production and maintain the winery’s strong ties to Niagara. Chateau des Charmes is a natural partner with an un-precedent premium grape supply (close to 300 acres) and state-of-the-art facilities. A further announcement, which I, a golfer (my handicap is locked up in a vault) was thrilled to learn, Mike Weir has partnered up with Niagara Parks with plans to build a Mike Weir Winery, winery retail and hospitality centre, planting of grapes and on-site processing, plus a Mike Weir Gallery, all this on a 15 acre parcel of land adjacent to the Whirlpool golf Course! Life doesn’t get any better than this. After a few moments of speaking with Mike personally, we learned of his incredible dedication to his foundation. He tells us that the Mike Weir Wine brand started as a conduit for him to feed his passion for his foundation which assists the physical, emotional and educational welfare of children in Canada. When asked if he enjoys a glass of wine or two every day! he pauses and states “not while on tour”, but when I’m not, definitely! “What’s the best red varietal planted or favorite we ask” Barry Katzman jumps in with “Pinot Noir”. We talk about Mike being the only golfer we can think of that will actually have a Mike Weir winery, as most other golfers only have the label. “Will we be seeing more of you Mike” we ask “once the shovel goes in the ground”? Affirmative, with family in Niagara and now this exciting venture, “I’ll be around” he smiles with those fabulous eyes! yes it’s true ladies, he’s very charming and definitely has a heart of gold, our Canadian Golf hero! 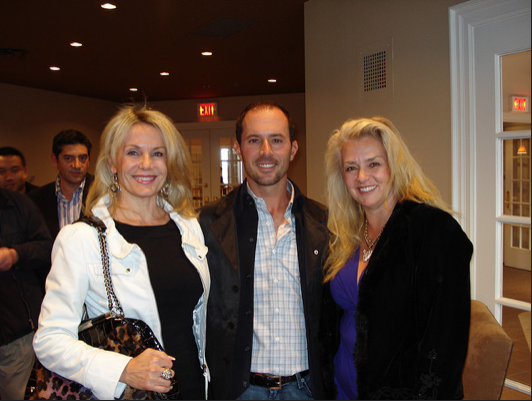 For more info please visit Mike Weir Wines and the Mike Weir Foundation. November 20th, 2008 is the kick-off of the annual Gourmet Food & Wine Expo here in Toronto. Touted as Canada’s best consumer food and wine appreciation event, the Gourmet Food & Wine Expo enters into its 14th year at the Metro Toronto Convention Centre from November 20-23, 2008. Loved the show last week on whiskey! One of the topics I didn’t hear you cover was how to best enjoy whiskey; in terms of preferred type of glass, are the standard tumblers suitable? Is swirling the glass as you do in wine tasting a good or a bad idea and what does the addition of water do to the whiskey’s flavor?